The registration desk is located at level -2 of the IST Congress Center. The main entrance for WIAMIS 2004 participants is from Rua Alves Redol – see map below. There is an Internet room equipped to allow Internet access, during the workshop days, from 9 am to 6 pm. 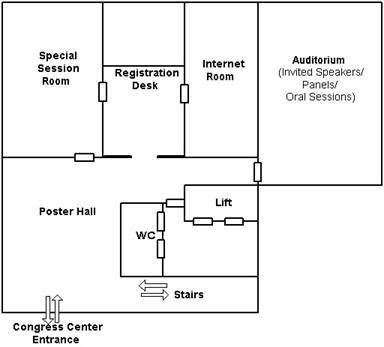 The Internet room is located in level -2 of the IST Congress Center (room 02.3) – see map below. Wireless LAN access will also be available. There will be two coffee breaks per day, one in the morning, at 11:20 am, and one in the afternoon, at 4:35 pm. 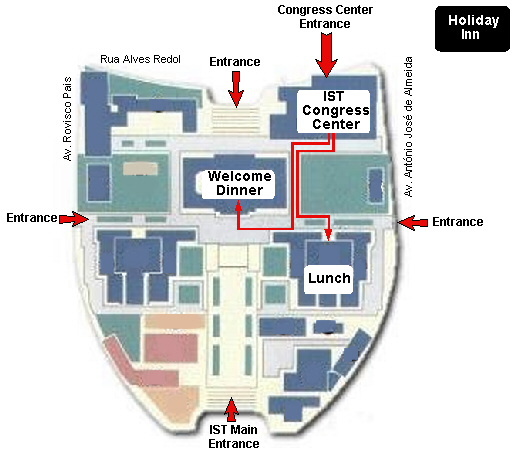 The coffee breaks will be served in the Poster Hall at level -2 of the IST Congress Center – see map above. Lunches will be offered during the three workshop days (included in the registration fee). Lunches will be served in the ground floor of the Electrical and Computers Engineering building, also called "Torre Norte" see map below.